One of the important tenets of modern analysis is adjusting for context. If every player has a .300 batting average, then a .300 batting average is nothing special. (The entire National League had a .303 batting average in 1930, for example.) In my early days in baseball I had a very difficult time getting this point across. As Bill has written, statistics are not truth, anyway; they are an approximation of the truth. To severely paraphrase Shakespeare, there is nothing good or bad but context makes it so. 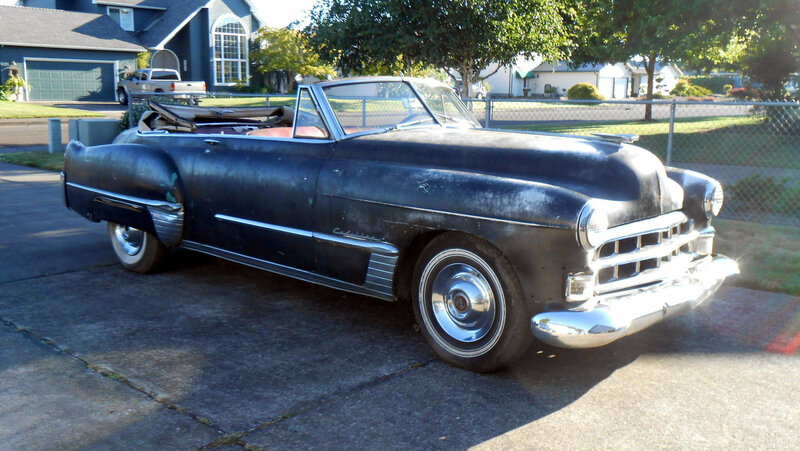 From barnfinds.com a picture of a 1949 Cadillac Series 62 convertible that appears to be a genuine barn find. Note the small fins at the rear of the car. The beginning of the fin trend actually started with 1948 Cadillacs and almost everyone knows that Harley Earl and his fellow GM designers were inspired by the design of the Lockheed P38 Lightning airplane. 1949 was a significant year because it was the first year that a modern, overhead-valve V-8 engine was available. Both Cadillac and Oldsmobile featured such engines in their 1949 cars. It was the second time in a decade that those two makes offered a groundbreaking innovation as the first truly modern automatic transmission (the Hydra-Matic), jointly developed by Cadillac and Oldsmobile, was first offered by Oldsmobile on its 1940 model year cars. Of course, something called World War II interrupted automobile innovation in the interim. I know I have written about the 1949 Cadillac and the OHV V-8 before, but that car and engine were very significant. Hey, I’m getting old and starting to repeat myself. What can I say? You are quite right that the ’49 Cadillacs are very significant cars. Compare a ’49 Cadillac with its OHV V-8 and outstanding-for-the-era styling with a ’49 23rd Series Packard and, if you are a Packard fan as I am, you’ll know that Packard was in deep trouble vis-a-vis Cadillac. Re the Hydra-Matic – early prototypes were 8 speed units but the goal of engineering was to get them down to 3 speed units. The early production Hydra-Matics (and going into the late ’50s) were 4 speed units. Now, in the era of emission regulations, etc., 8 and even 9 speed automatic gear boxes are common! The more things change, the more they stay the same. GM fitted some tanks with Hydra-Matic transmissions – talk about being battle tested! Thanks, 56packardman. I had no idea some tanks had Hydra-Matic transmissions.